Boxcutters, Jigger, Mixing-glass, Strainer, Stirrer (long Spoon), Martini Glass. 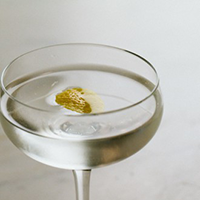 Combine all ingredients in a Mixing-Glass, stir with ice cubes for 30 seconds and strain into a chilled Martini Glass. Twist the Lemon Zest over the drink and use as garnish.